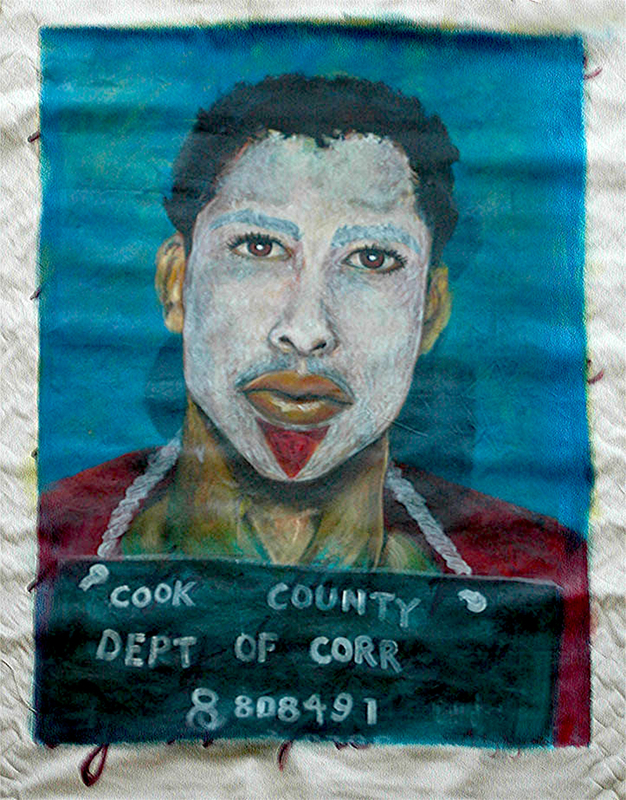 Chicago Latino Art Artchive–with art work photos from the Jose Gamaliel Gonzalez Collection adn other sources now being added and with further revisions coming in near future. Interviews, documents and research work on pioneer Chicago Puerto Rican artists from the 1960s to the present, With special guidance from John Weber, Paul Sierra, Eduardo Arocho and Olga Herrera, as well as Ángel Quintero Rivera from the Center of Social Sciences of the University of Puerto Rico, Rio Piedras. The materials included frame existing interviews. 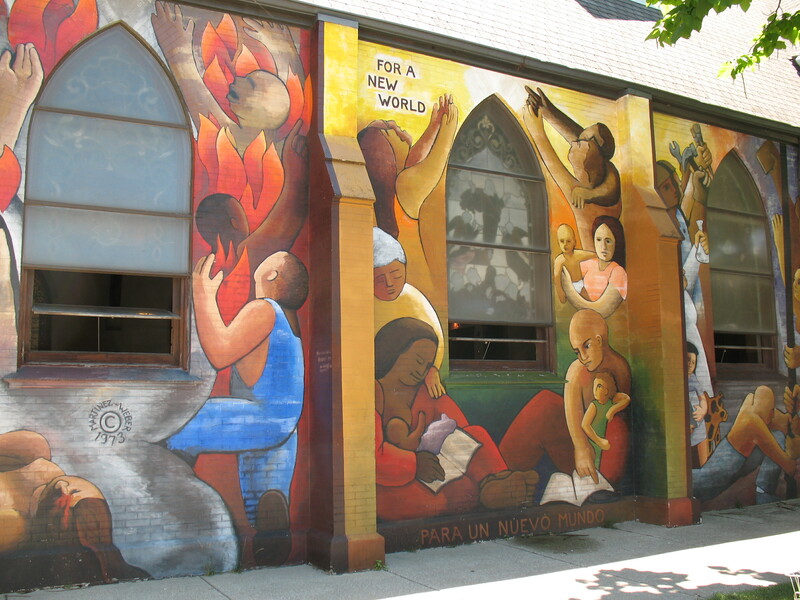 For a more complete compendium of images, see Chicago Boricua murals–a variety. B. Art Organizations, Museums, Galleries, etc. Taller. See Gamaliel Ramirez below. National Museum of Puerto Rican Arts & Culture. a. Interview with Cuban-American Paul Sierra on Rufino Silva. d. ICP photos of 1 painting in color, 1967 and 1972 exhibits (black and white). a. Silva Visuals in Puerto Rico and Washington State. Not yet available. https://books.google.com.pr/books?id=KCsVAQAAIAAJ. ‎University of Notre Dame. Institute for Latino Studies – 2008. Interviewed by Marc Zimmerman (Feb. 2017) in Caguas, PR. 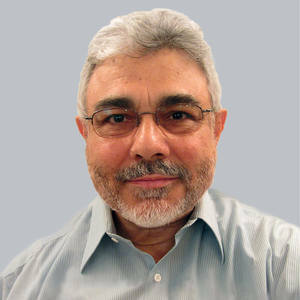 Gamaliel Ramirez was born on November 11, 1949 in the Bronx, of New York, A Boricua, Nuyorican who has worked in Chicago as an artist / teacher artist for over 35 years and retired in Santa Rita, San Juan, Puerto Rico. Gamaliel passed away on May 21, 2018 after being hospitalized after Hurricane Maria for 8 months. “Remembering Gamaliel Ramirez.” 2018. El BeiSMan. http://www.elbeisman.com/article.php?action=read&id=1636. II.. Some sample images–photos, studio work and murals from GCOL and CLAS archives. 2. Artists not yet interviewed. In the early 1970s, the Puerto Rican Art Association, whose most visible members were Mario Galán Jose Bermudez, and Hector Rosario, produced two murals of considerable importance, one entitled the Crucifiction of Pedro Albizu Campos. La Crucifixion de Don Pedro Albizu Campos, 1971. Artists: Mario Galan, Jose Bermudez, Hector Rosario. Location: 2425 West North Ave. • Don Pedro Albizu. Location: 2425 West North Ave.
Don Pedro Albizu Campos, the leader of the Puerto Rican Nationalist Party, is depicted crucified in the center alongside two other Nationalists of the 1950s. Portraits of six independence and abolitionist leaders of the 19th century are lined across the top. The flag in the background is called the La Bandera de Lares. It represents Puerto Rico’s first declaration of independence from Spain on September 23, 1868. This armed uprising is historically known as El Grito de Lares. It took nine years to save this mural from destruction. A new condominium was planned and if built, would have blocked off the mural. Community members concerned about gentrification of the neighborhood as well as saving the oldest Puerto Rican mural in Chicago went into action and saved it. La Crucifixión de Don Pedro Albizu Campos: Mural;. Popular Humboldt Park Latino Pastor to lead the Albany Park Evangelical Covenant Church. Residing 1980-2010 (LAS has interviews with Adlín Ríos and Ivelize Sánchez Sanders and some photos of Chicago art work possibly available from mzimmerman@uh.edu). Residing in Chicago, 1979-1982/ 1983-1985, at least one visit after 2000. (Interviewed without recording, notes and Chicago images possibly available through mzimmerman@uh.edu). LILLIANA RAMOS COLLADO PALABRAS.ENCONTRADAS Bodegón con Teclado ~Un espacio para lo íntimo: Arnaldo Roche Rabell. Comentario sobre arte y literatura. McLean, Cheryl (2010-07-05). “Arts Crossing Borders: Artist Filmmaker Seeks Healthcare Equity in Territories of the Breast”. 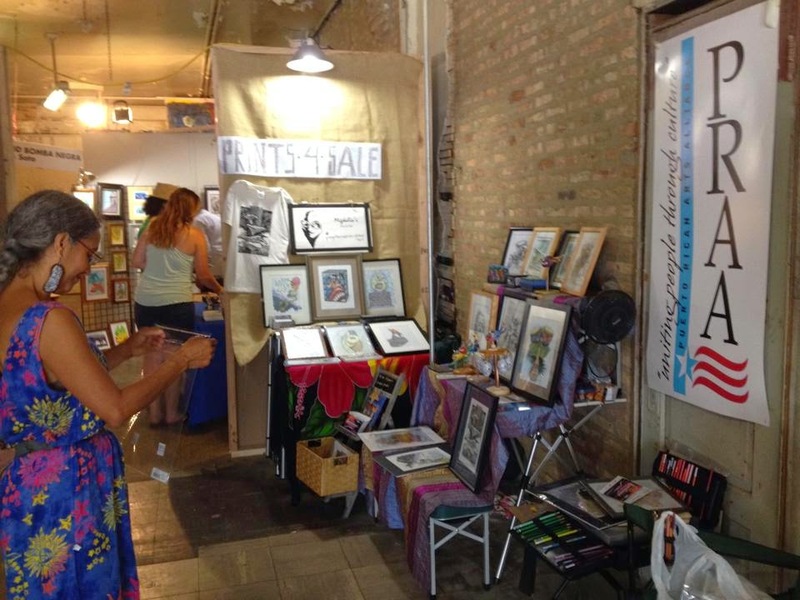 Elgin, IL-based Carribean folk artist, art gallery, sculptures, jewelry. Martin Soto, Migdalia Galarza, Moses Perez and others. 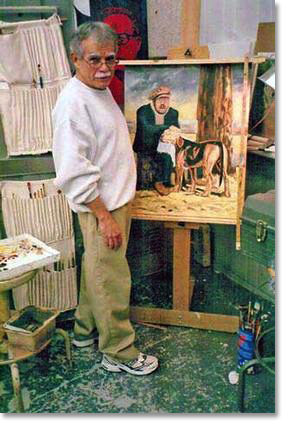 Oscar Lopez at the easel, painting of former prisoner Carlos Alberto Torres with his dog. 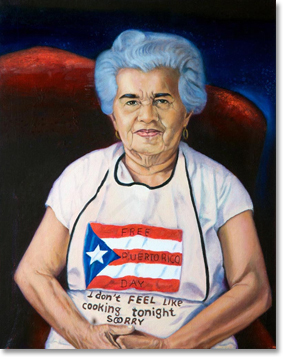 All painting images courtesy of Oscar López Rivera and the National Boricua Human Rights Network. 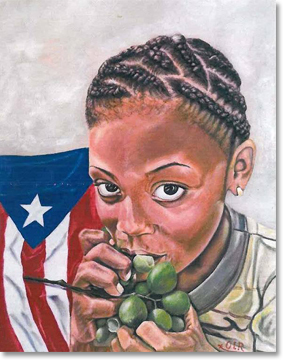 Girl with Quenepas (Spanish limes) and the Puerto Rican flag. Painting of the post-Katrina Superdome, New Orleans. Jorge Felix. 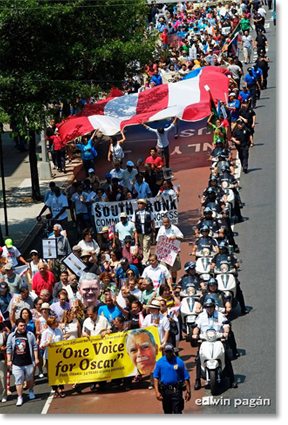 “Not Enough Space – Art by Oscar Lopez Rivera and Carlos Alberto Torres. See also Marc Zimmerman, Defending their own in the Cold (www.lacasachicago.org, Component I), chap. 2. Aren’t I a Womyn? is a spray paint and acrylic mural painted on a wall of Roberto Clemente High School at the corner of Division and Western. The piece is 10 feet high and 107 feet long. The project was co-sponsored by the Puerto Rican Cultural Center. The mural combines graffiti lettering with images inspired by texts from Sojourner Truth, Julia de Burgos, and Sor Juana Ines de la Cruz. 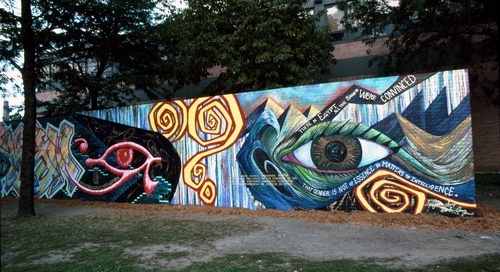 The piece was painted by Gude and Dzine with the assistance of Brian C. Morris and 13 teen artist assistants. Still Deferred; Still Dreaming co-sponsored by the Dr. Martin Luther King, Jr. Boys and Girls Club at Washington and Sacramento. The piece is 27 feet high and 90 feet long. 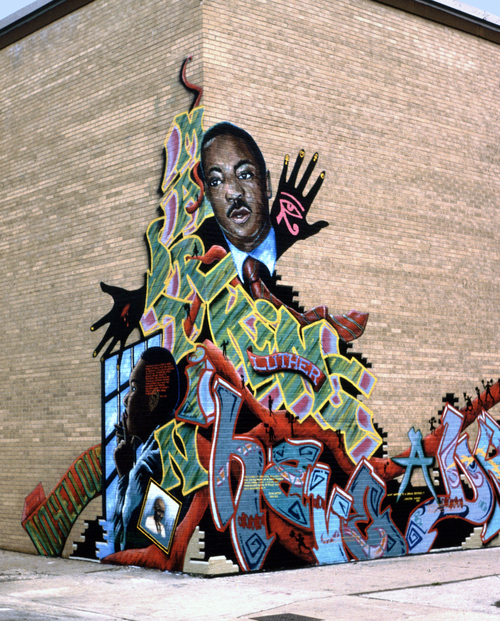 A spray paint and acrylic mural, it is composed of graffiti style letters saying “Martin Luther King…have a dream,” portraits of King and Gandhi, tiny figures of civil rights marchers designed by neighborhood children and quotes by Africans and African Americans discussing dreams and life. Along with Dzine and Gude the piece was made with assistant, Brian C. Morris, Solo, and 5 teen artist assistants. Time is the Enemy.. By Carlos Dzine Rolos.. 2009 /Venetian glass, marble and stone mosaic..
Y Tu abuela a’onde ehtá/ What Color is Your Grandmother? 1991. pastel on paper. 84 x 60 in. 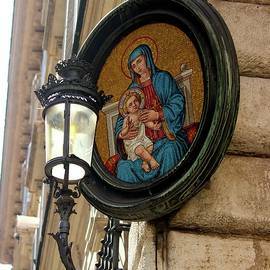 Cecilia Puerto. 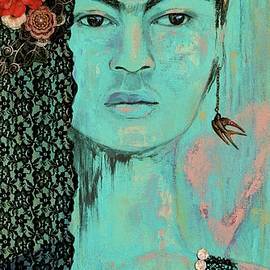 Latin American Women Artists, Kahlo and Look who Else. https://books.google.com.pr/books?id=1vsOMopLwp0C&pg=PA181&lpg=PA181&dq=Bibiana+Suárez&source=bl&ots=EUikxSgYHH&sig=358QSZr2WpGX3K9MSXFa9654zbE&hl=es-419&sa=X&ved=0ahUKEwiQ8_3UqsvMAhXJ7R4KHRVHDBQQ6AEIZDAM#v=onepage&q=Bibiana%20Suárez&f=false [Artist’s Statement by Bibiana Suárez re: Identity and Exile]. ID: 1064462. Transnational identitites : cultura en proceso / Bibiana Suárez. Chicago : DePaul Art Gallery, 1995. See Defending Their Own in the Cold: The Cultural Turns of U.S. Puerto Ricans. Chapter 2. (Chicago Connections Interview, MZ and Esther Soler 2013). Antonio Martorell: “Gestures” (June 2011 – June 2012) An Exhibition of Woodcut Prints. Wilfredo Cruz. Puerto Rican Chicago. Harold Washington w/ Luis Germán Cajiga Exhibit Caballeros de San Juan 1986. 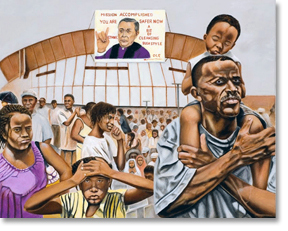 This Will Have Been: Art, Love & Politics in the 1980s Feb 11–Jun 3, 2012. The Puerto Rican equation: art as plebiscite for survival, struggle and sovereignty. An SAIC professor's paintings have become “vibrant camouflage” at Paris Fashion Week. Nothing is True, Everything is Permitted: Josué Pellot & Hector Arce-Espasas. 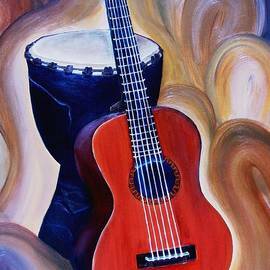 Artist Performance Videos Art Portfolio. Images for Reynaldo “Guaracibo” Rodriguez. Angel Otero, Recent Paintings, Union League Club of Chicago, Chicago, Illinois. 2006. Worked on several murals with Gamaliel Ramirez before he left Chicago, and then established her own career. Worked on several murals with Gamaliel Ramirez, and then established her own career. 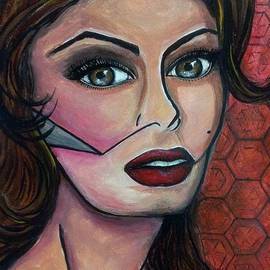 Star Padilla is a Chicago-born teacher, artist, painter, muralist, and children’s book illustrator. She spends a majority of her time as a freelance mural painting instructor, and has been working with students in Chicago’s public and private schools for fifteen years. In the last year alone, she has lead the painting of murals in Englewood, Cabrini Green, Humboldt Park, Wicker Park, Logan Square, Old Irving Park and Evanston. And she loves the work: “I love working with youth and teaching them that art is more than a hobby or a talent, to the committed personality it’s a way of life. But I also teach kids that art is a wonderful way to express oneself no matter what’s going on in their lives.” She recently completed a mural on the Paseo Boricua at 2459 W. Division on the back wall of the West Town Bike Shop. ..
Rodriguez is a self-trained artist, who has a passion for color pencil drawing, acrylic paint on canvas, mixed-media work and murals. His artwork takes his family and Puerto Rican heritage as the central motif if representation. He says of his pieces, “They are the results of my aesthetic and intellectual development, and belong to different stages and states of mind. They are my reflections, my creations. 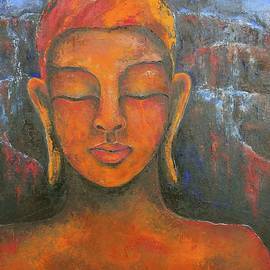 I always paint for myself and for anyone who may enjoy what I paint. All the projects that I work on, they have to relate to me.” In scrolling through images of his work online this becomes apparent. All are of incredibly intimate subject matter—his wife, seated with a peacock on her shoulder in front of a full moon, a man in chains kissing the belly of a pregnant woman, a middle-aged man daydreaming about palm trees and waterfalls, a couple dancing on a beach—and though most appear to be in the present day a good number recall Puerto Rico’s history: indigenous populations, the Conquistadors, slavery. Rodriguez, thus, melds his personal present with his collective past, making images that are at once both insular and relatable. 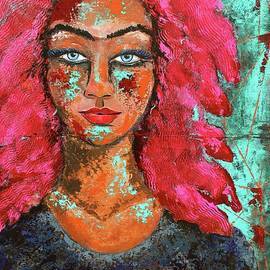 Edra Soto moved to Chicago from San Juan ten years ago to get her MFA in painting at SAIC. She is interested in creating and promoting non-commercial art and often utilizes a wide-range of materials in her complex installation pieces. Two years ago, she began exploring explicit media images of Latinas. Her work in this area addresses the concern that the sexual agency of Latinas in visual culture has barely progressed and possibly even regressed in the last forty years. In her 12×12 piece at the Museum of Contemporary Art  … , The Chacon-Soto Show, she honed in on Iris Chacon, a pioneer of the vendetta movement in Puerto Rico in the 1970s and pop culture icon, in order to question the fascination of Latinas with self-exposure and examine the way in which Latino culture is portrayed in the mainstream. Brenda Torres is a SAIC-educated performance artist, who has been working between Puerto Rico and Chicago as an artist, curator and educator for the last ten years. She has taught at Dr. Pedro Albizu Campos High School since 2008 and in recent years has achieved notoriety for being the youngest contemporary art curator working at a museum in Puerto Rico. She sees all of this work, however, as part of her greater body of performance art. “I use ‘performance art’ as the contrivance that encloses my entire body of work,” she says. “I use performance art as a model in my curatorial practice which pays close attention to those works that explore human behavior. As a result, my educational approach involves finding meaningful tools and resources to challenge the social predicaments that historically had been in charge of marginalizing people in society.” She has been actively involved with Chicago’s Puerto Rican arts community in myriad ways, including the creation of murals with ex-political prisoners, performance workshops for the peers at Vida/SIDA, community lectures with IPRAC, exhibitions at local galleries, and the organization of the Puerto Rican Day Parade and Haunted Paseo Boricua. She does so, because she genuinely believes she can help the community grow through her artwork, programming and education. Jose Cha Cha Jimenez. Young Lords in Lincoln Park. Felícitas Nuñez interview and trancript. (2 houir plus video interview including an extended discussion of the Young Lords Armitage Street Mural. 1969. John Pitman Weber.Puerto Rican themed murals. Wilfredo Cruz on Guerrero/Oscar Martinez, Smash Plan 21. Hector Duarte mural Latino Student cultural center uic.